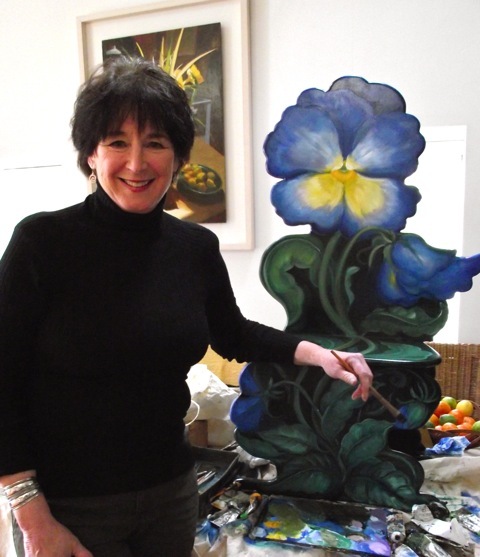 Pamela Silin-Palmer moved to Ireland with her Irish artist husband, Patrick Palmer, from California in 2004. In America, Pamela worked as a nationally recognised decorative artist /designer and illustrator for over 30 years. In the United States she was represented in Beverly Hills, New York, Chicago, Palm Beach, San Francisco and other major American cities in high end designer showrooms and galleries. Through her representation she created art for clients such as the Disney Hotels, Paris and The Grand Floridian; stars like Bette Midler, Jay Leno, writer Danielle Steele, executives such as the CEO of Guess Jeans, Mr. George Marciano, the president of Ford Motors, Mr. Don Peterson, and Bill Gates -Prince of High Tech, to name a very few. Pamela will supply a beautiful bouquet to work from, plus many books featuring images of animals, plants, and various forms as reference. A student certainly should be encouraged to bring your own ideas, a story to tell, a memory, an experience, something visual that you love, something amusing to play with in the mind's eye, .and whatever reference sources you choose to help create the work , this may include photos, story ideas, memories and other reference volumes.